Sylvia's is back with a new look in 2019! The Sylvia's La Canasta Restaurant Family is presents, OFF THE GRILL, our newest venture. We’re so excited to bring the North West Valley FRESH MEXICAN FOOD & FAST SERVICE. We are still serving our delicious fare at our 38th Avenue & Indian School, Sylvia’s La Canasta Express Location. We are always happy to see our customers and look forward to seeing you at OFF THE GRILL SOON! Sylvia, along with her family of the La Canasta Mexican Restaurants, are a treasured tradition in the Valley of the Sun. The first La Canasta Mexican Restaurant opened in 1962 and it was there that Sylvia mastered her skills as a restaurateur. In 1988 she branched off to open Sylvia's Restaurant and Fiesta Catering Services, a popular Phoenix dining location. Because Sylvia understands the demands of the modern diner, she eventually opened Sylvia's Mexican Express restaurant, a drive-through restaurant designed to deliver high quality authentic Mexican food at a fast-food pace. Today Sylvia has seen the demand and for fast casual sit down dining and now will be offering this convenient fare to her loyal customers. This fall of 2018 will be her grand opening of Sylvia's Fresh Mexican Cocina in the North Valley . ( 19th Ave Deer Valley Road) Sylvia's also offers the convenient Uber and Amazon Service to her customers. Sylvia's success in the Mexican food business is attributed to using only the freshest ingredients along with her family's secret recipes and close attention to the quality of service provided for her customers. With this combination, it's no wonder that you see the same happy faces in the restaurants week after week. The same is true with the Fiesta Party Platters she offers and the loyal clients that purchase them repeatedly for their parties and refer their friends as well. Sylvia's fresh assortment of Salsa. Sylvia's offers guests the Chip and Salsa featuring, Freshly made Mango Salsa, Salsa Fresca, Hot Sauce, Avocado Sauce, Salsa Verde, Pico de Gallo. Buen provecho! Sylvia has always been surrounded by the unique flavors of Sonoran-style cooking. As a young girl she enjoyed spending time in her grandmother's Mexican kitchen, watching skilled hands stretch homemade tortillas and stir together sauces bursting with aromas of fresh chiles and spices. She grew up in the markets and small restaurants her parents owned in Phoenix, Arizona, and along with her six siblings, learned the food service business from the inside out. Favorite dishes, such as such as Menudo Rojo, Chile Rellenos and Chorizo con Huevos - along with family favorites Mariscos con Arroz, frijoles and Tia's Tequila Quenchers, were prepared for patrons in the family's neighborhood restaurants and new recipes were created for guests with insatiable tastes for flavorful Sonoran cuisine. Today, after many years of crafting great food and providing stellar service, Sylvia's Mexican Restaurant has become the standard-setter in the Phoenix food service industry. Perfected through the application of old-world experience, the finest, freshest ingredients and a genuine love of great food, Sylvia's trademarked menu items will be sure to please even the toughest Mexican food critic. 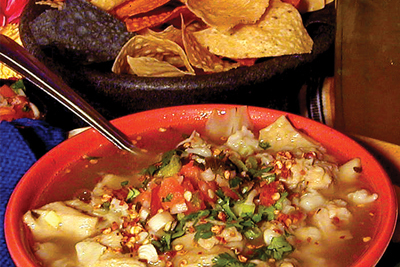 Sylvia's Mexican Restaurant serves a full menu of Sonoran favorites. Pick up her book Sylvia Cooks Sonoran Style at either one of her locations.